Over the past two days, I’ve observed something several times which has led me to develop a hypothesis. Then I went looking on the Internet for how to test my hypothesis and ran into all kinds of explanations and formulas and statistics, which lead me to come up with another hypothesis that “statistics can make your head hurt”. I have no interest in testing out my hypothesis on statistics because of the probable pain involved. My other hypothesis has no pain involved. It’s all about happiness and what makes people happy. I’m not even sure it is a hypothesis, though, because I don’t think it can be proven to be emphatically true or emphatically false. Instead of proving my hypothesis, I may just make up a statistic about it, such as “Four out of five people…” and let someone come forward and prove me wrong. After all, aren’t 80% of all statistics made up, including that one? Regardless of whether it is a hypothesis or a series of observations that can be quantified as a statistic, I’m sure that even if there was evidence to the contrary, I’d still believe what I observed not once, not twice, but three times in a twenty four hour period. In fact, now that I think of it, I’ve never seen any evidence to the contrary in regards to my hypothesis which is enough to make it true in my book. My first observation occurred at an antique mall. I came across a booth and saw the tell-tale handles of garden tools sticking up in a corner. I walked over and looked down to see the business ends of the tools and what do you think I found? That's right. I found a hoe. It was an old, rusty hoe with a well aged handle. I pulled it out and carried it with me through the mall and observed that each person I passed looked at me, looked at the hoe, and just smiled. My second observation came from an email exchange. I got an email from someone who had been searching on the Internet for a specific type of scuffle hoe. He came across my hoe collection page where he apparently found the exact hoe that he wanted and so he sent me an email asking where he could buy it. I fired back a quick reply along the lines of, “I’m sure you can find one via Google”. He wrote back that he’d searched for an hour unsuccessfully, so I went and looked at my hoe collection, saw which scuffle hoe he wanted and sent him the exact link for where to buy it. He wrote back and said I had made him very, very happy, so happy he could cry and he was going to buy one for his mother, too. My third observation happened when the UPS driver stopped at my house earlier today. I met her at the truck as she pulled out a long box and said, “It only weighs three pounds”. I replied, “It’s a hoe”. She just smiled and handed it to me. It was a big smile. I think those three observations are enough for me to put forth my hypothesis with a high degree of confidence that it is true. I believe that at least three out of four people, or more, will find it to be true. But before I finalize any statistics related to my hypothesis, I should gather some more evidence through observation, through the reactions of those who might come across this post and read this far. To assist me in proving my hypothesis and validating my statistics, please view the following picture and then leave a comment describing your first reaction. Choose from these three possible reactions. Thank you for helping me validating my hypothesis, to be known in scientific journals as Dr. Hortfreud's Hoepothesis. Ok...it made me smile! But that is because I know those hoes make YOU happy and somehow that makes me happy and so I smiled. Gardening...the happy addiction. I'm a #3, but as predicted, I don't even own a hoe and am not qualified to participate. I think, though, that in my case it's more a matter of People with crazy hobbies make me smile. You have a beautiful hoe collection! It made me smile. 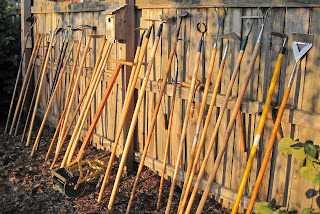 More than that, it made me laugh.....so many hoes... That is one dedicated gardener. I have to admit I had not previously considered the hoe a happier tool than the other tools, but as I smiled at your photo you may be right. Perhaps you need a control picture of antique garden forks? I am definitely smiling your Hoeness. Oh Queen of Hoes, the picture, and the narrative made me grin like a cheshire cat! Congratulations on your new hoes! It made me smile! ...and yes, stats can make your head hurt. Who does not love a hoe? This picture has got to make you smile or you are not human. Really, you would have to have a heart of stone. 2) It did not make me smile. Only because I wanted some of those hoes! I rarely used my two hoes until I created a vegetable garden. 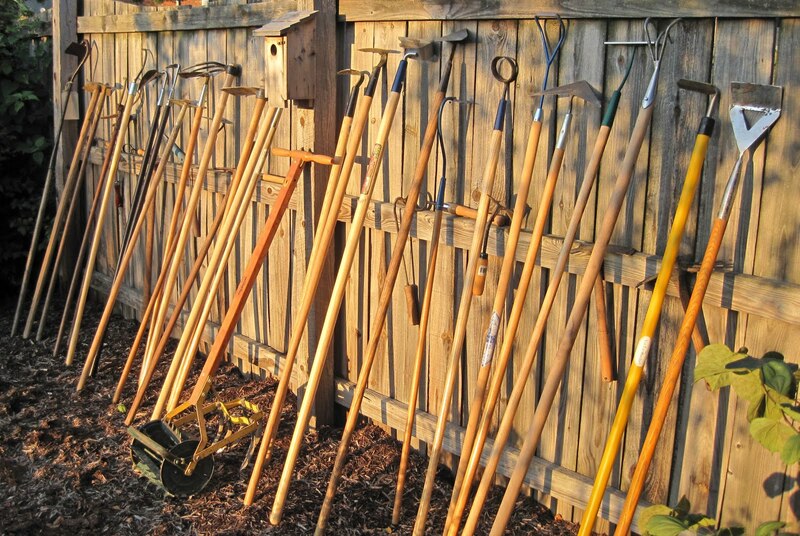 Then just yesterday as I was trying to hoe some weeds around my plants with my honking big hoe, and I thought of your hoe collection and the fact that you probably have exactly the hoe I needed. I smiled for the same reasons as Leslie! I will be on the lookout for hoes this fall when it's antiques festival time in Round Top/Warrenton. Made me smile. Boy, that sure is a lot o' hoes. It made me smile. And then I wondered, how many of those hoes do I need, and not even know it? answer #1 please ;) I am learning to appreciate a variety of hoes! There was someone at my place looking for hoes a few days ago. I wonder if it was the same guy you hooked up with his fantasy scufflin' hoe. Opton 4: It made me laugh. Nice lead up to the picture. You may have an obsession - good for you. I had a reaction but I shan't share it!! but I did smile. I have been out of touch with my garden blog and following all the blogs I love so much for about three months. Today I was trying to catch up just reading some of my favorites and I came across your 'Testing a Hypothesis'. My reaction was not only to smile but to giggle, truly giggle. And I am still smiling. Love your blog and absolutely love your hoe collection.